Yippee! We’re back with another ocean-themed printable for you today! As you may have noticed, working through the Ocean Guide by The Peaceful Press has really jump started our imaginations and lead to all sorts of fun ocean-themed crafts and activities. Today we’re sharing a super adorable ocean craft for you! If you’re rounding up fun crafts and activities to do with the kids for your next ocean themed unit study or morning basket, you will definitely want to add this fun seashell math game to your list! 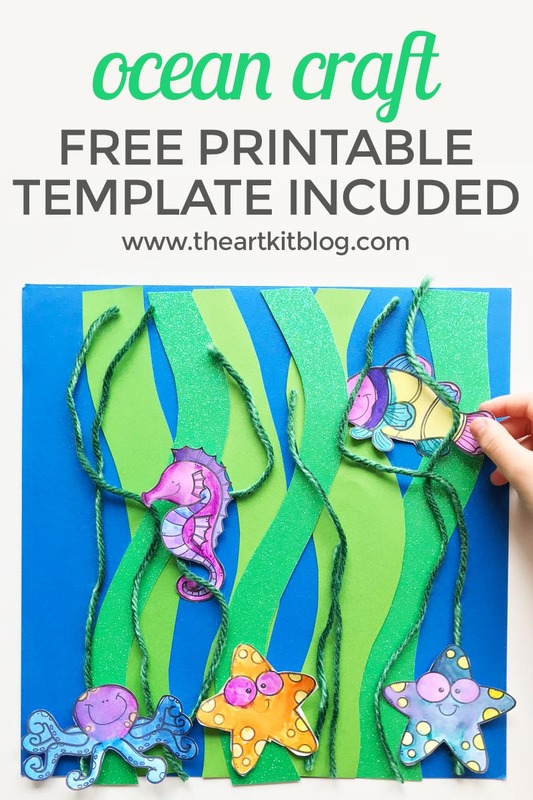 Print out the sea animal printable. Cut them out and watercolor paint them, color them with crayons, or cover them with balled-up small bits of tissue paper. While they dry … cut out random wavy strips of green paper. Glue them to a sheet of blue cardstock. Glue strips of green yarn on top of the green strips. Overlap randomly. Have fun! It doesn’t have to be planned out or look perfect. Glue the sea animals on top of the kelp. You could also slice a bit of the kelp, attach the sea animals to popsicle sticks, and make your own kelp forest puppet show. The kids have been having such a blast with this roll and count shell game!Be sure to sign up for our newsletter list so you are the first to know when new themes are released.